Two farmers have formally asked the Ontario government to carry out an environmental assessment of genetically modified (GM) alfalfa before the seed is sold in the province. Today, they launched an application under Ontario’s Environmental Bill of Rights, the first ever request relating to the issue of GM crops. “The federal government has failed us, but the Ontario government can step in to protect Ontario’s environment and farmers,” said Dianne Dowling, an organic dairy farmer near Kingston, and one of the two applicants. In late April the Federal Agriculture Minister, Gerry Ritz, allowed the first-ever GM alfalfa variety to be registered in Canada in spite of nation-wide opposition. This means seed companies could put GM alfalfa on the market at any time. The company Forage Genetics International has put Monsanto’s GM herbicide tolerant Roundup Ready trait into alfalfa and says it wants to introduce it in Eastern Canada. “Many conventional and organic farmers in Ontario share the same concerns about GM alfalfa,” said Coral Spoule of the National Farmers Union Ontario. Alfalfa is an important part of pasture and hay for animal feed, particularly for dairy and beef farmers. Alfalfa improves soil fertility and quality, and is often grown to support vegetable and grain production. Alfalfa is a perennial crop, pollinated by bees. Under the Environmental Bill of Rights, Ontario residents can request an environmental assessment if they believe a major new commercial activity could negatively impact the environment and economy of Ontario. The application points out that GM contamination would be unavoidable. It also details the environmental and economic costs of herbicide resistant weeds and increased herbicide use that would result from GM Roundup Ready alfalfa. It was prepared by a large community of individuals and groups who share concerns about the risks that GM alfalfa poses. “We’re supporting farmers in Ontario because we all need this same protection,” said Lisa Mumm of Mumm’s Sprouting Seeds in Saskatchewan and a member of the Organic Agriculture Protection Fund (OAPF). 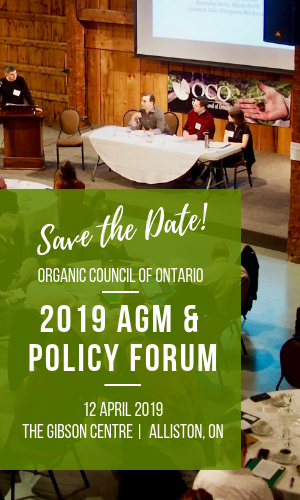 The OAPF, along with the National Farmers Union and the Canadian Biotechnology Action Network, prepared the evidence submitted to the Ontario Government and are supporting this challenge. For more information: Dianne Dowling, 613 546 0869; Dave Lewington, 705 594 1823; Coral Spoule, National Farmers Union Ontario, 613 464 8945; Cathy Holtslander, National Farmers Union, 306 652 9465; Lucy Sharratt, Canadian Biotechnology Action Network, 613 241 2267 ext 25; Lisa Mumm, Organic Agriculture Protection Fund, 306 747 2935.